my first 29th february post.. I was thinking about updating a few days later but since it's the 29th, a date which comes only four years once, I will write a post today whether I have inspiration or not. One In A Million final will be aired tonight. Sadly, I have to watch the recorded version for the beginning of the show since I will be having the tutorial class tonight. I want Ayu to win! To me, celebrities who participate in reality talent shows are peoplw with thick skins. Stealing the limelight from the rookies when they already have their share of fame. What a disgrace to themselves! It's not my business anyway to care about who has thick skins and who does not. Here's one beautiful song by Redwan Ali. Would You Be There. Enjoy! It's also the closing song for the series 幸福双人床 (Mars Vs. Venus) currently aired on AEC every Monday to Friday at 7 pm. The rain finally revisits Ipoh after so many days. I miss the cool and moist air. the true value of a pencil.. 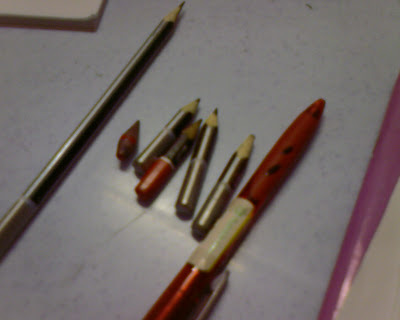 Although mechanical pencils are invented many years ago, some things just do not change. 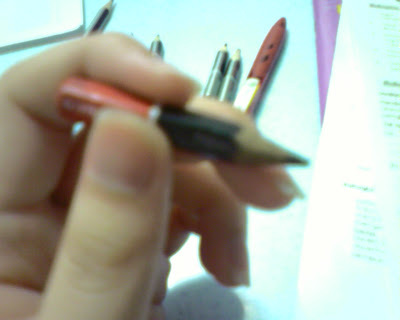 Using a pencil till it's that short. It's remarkable, isn't it? I don't think I can use a pencil until it's that length. I remember throwing pencils away when they were still quite long, probably double that length. I feel even more ashamed when I look at this one. If I were to be that particular pencil, I would be very proud. My task to stain the paper/change thoughts into written form is well achieved. I can hold the pencil in no other way. As long as the lead is still in existence, the pencil is not useless. I respect kids who know the true value of a pencil. For the full list of the 80th Annual Awards results, click here. This is one of my favourite horror flicks which I remembered watching many, many years ago. I actually wanted to watch it again a few years back but I just couldn't remember the title. All I remember was, there were several children who had psychic powers to control humans using their eyes. Click here for the synopsis. Until two days ago, I saw the movie on Cinemax. The title was Village Of The Damned and not The Eyes. I thought the title had something to do with the eyes. See how poor my memory is? This is the cover of the CD I think. Looks so scary. A bunch of white-headed kids with eyes powerful enough to kill. The angrier they get, the redder their eyes would be. 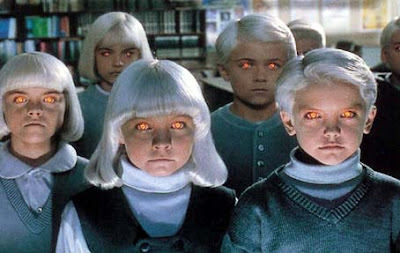 Village Of The Damned (1995) was actually a remake of the original film in 1960. 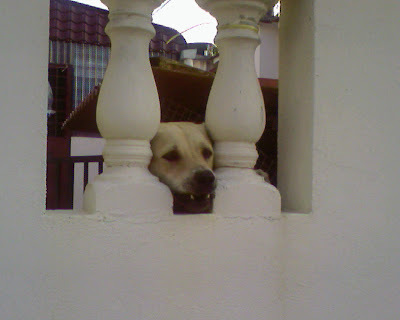 Once upon a time, there lived a prince high up behind thick walls. He was somewhat beautiful and precious to his royal family. However, he was never happy. How can anyone be happy living trapped all his life? Mr. Prince longed for his true love to set him free. Days became weeks and weeks became months. His true love never came. But fate is a funny thing. After several years trapped in his lonely 'cell', the maid finally took him out to have a taste of Mother Nature. That was the very first time he felt joy in his heart. Then, he saw her. Right at the other end of the field, she stood there watching him silently. They ran towards each other but not for long, they were separated again. Mr. Prince thought he found his true love but why stop him right then? He thought he was happy being a free being. He thought that the happiness would stay when he met his true love. He was wrong though. So, so wrong. The next moment he knew, he was back in his 'cell'. And you know who his true love is? Well, sort of. 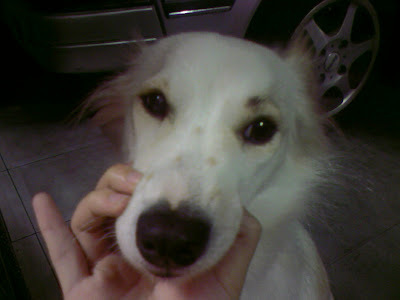 She even drew a mole on her face to be more attractive since the eyebrow was not enough to unleash her outward beauty. I want to find Mr. Prince! Crystle, forget him. He won't remember you anyway. Especially when he knows you are neutered. 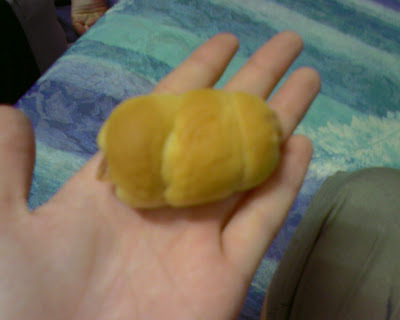 I forgot how long it has been since I've eaten a sausage bun which is so cute and tiny like this. This is the front view of the bread. 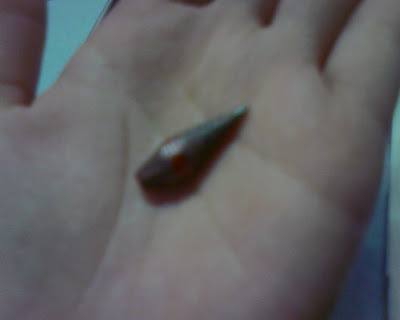 Just look how tiny it is. The sausage within is quartered and cut to the length of the bread. 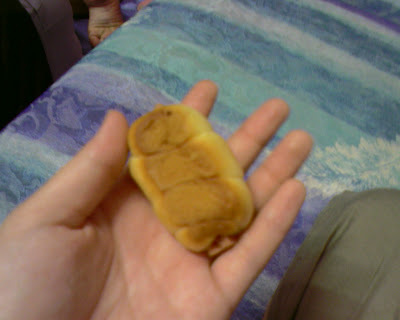 Unlike the bread of the normal size, this mini sausage bun is way easier to eat. Firstly, you do not need to open your mouth too wide to bite the bread. You just need to pop it into your mouth and munch away! I've eaten one. TWO MORE TO GO!! 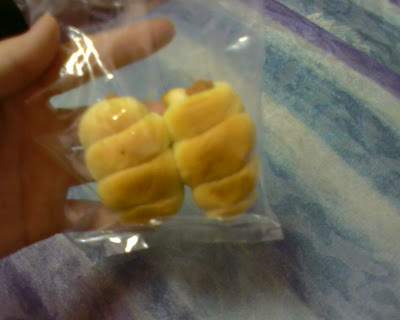 In future, I will choose mini buns over non-mini ones. P/S: Everything is getting smaller. Phones, digital cameras, etc. But the idiot box is getting larger and larger. A couple of photos to tell all of you that I am still alive in spite of eating so much. 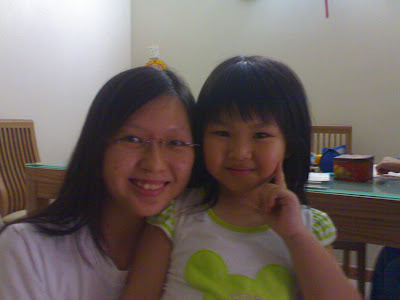 Anyway, I took a picture with Jolin!! Everyone knows her! She is famous, no? I tell you she's so darn cute and pretty. Okay, it's only her fan but she is still cute, right? She loves posing for the camera.See how happy she is in front of the screen. 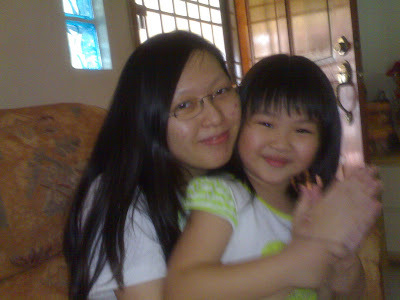 P/S: I didn't notice my hair is that long until I saw this picture. i think i am blogthings-crazy! While you're not sarcastic at all times, you definitely have a cynical edge. In your opinion, not all people are annoying. Some are dead! And although you do have your genuine moments, you can't help getting your zingers in. Some people might be a little hurt by your sarcasm, but it's more likely they think you're hilarious. This is a belated entry of Valentine's Day which, of course, I celebrated happily. Not exactly V-day for me but it's Single Awareness Day a.k.a. S.A.D. that I really celebrated. I am not sad as the acronym said. Being single is good for me. Yup, I feel very normal. Perfectly healthy. And happy. And I am not jealous whatsoever. I don't know why but V-day has no effect on me. I still ate like normal, slept like any other day and did my favourite things as usual. And BOOM! The clock struck twelve like any other day. Another Valentine's Day burnt together with the RMs most guys had to spend to keep their 'overly-pampered' other half happy for the rest of the day. I might be a little late but it's still not to late to wish every person in the world who knows the meaning of love to have a Valentine year ahead. May you have LOVE all year round! Everyone needs love. Especially God's love. Whenever there's a birthday, there'll be a birthday cake. What about Humanity Day or the day known widely as yan yat among the Chinese? We don't buy cakes to celebrate this special occasion. 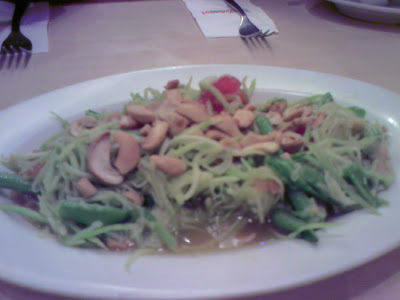 The whole dish is made up of many, many ingredients like carrots, cucumbers, parsley leaves, jellyfish, sour plum sauce and some others that I don't know of. It's eaten RAW. That is why it's called 'sang' in Cantonese. 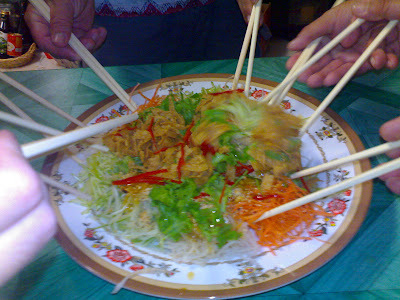 If the yee sang is supposed to be eaten after it's cooked, it'll then be call yee suk instead. 'suk' means cooked in English. WARNING: Below is a picture of me being gluttony. I love to eat so, so much. I've just taken a quiz and found out that I am fairly addicted to blogging. My addiction is not so serious, is it? Angpao-collecting days will soon come to an end. I don't like it. If this is the way to earn easy money, I want it to last the whole year round. Today is the 7th day of Chinese New Year which also means the birthday of every human being on earth according to the Chinese. So that also means I have 3 birthdays in a year: The Gregorian Birthday, The Lunar Birthday and the Seventh Day of the Lunar Year. It'a so good to have birthdays right? However, I am only celebrating the Gregorian one as the date is fixed every year. There's once when I only have 2 birthdays a year because the Lunar and the Gregorian birthdays were on the same date. Enough about my birthdays. Just want to wish everyone I know and don't know HAVE A HAPPY BIRTHDAY! It's Humanity Day, so let's celebrate it! This is true based on how much I eat daily. I should have a lot to write about my CNY celebration and the surprising thing is, I don't seem to be able to write all out. Too much to write probably, or maybe, I just can't remember what to write anymore. Too much carbs and fats is not healthy for you. I am a living proof. The 50th Grammy Awards has just ended. I don't know much about the Western musics as I did not keep myself up-to-date with the newest musics. I find them noisy. Maybe there's one or two that are nice, but everyone loves noisy songs than melodious ones. I guess the world has changed, that's all. My grandma just went back to KL this morning and I was so relieved. Totally good riddance. I do not hate her. It's just that she is pretty annoying. Nothing more. I think that's what grannies do. Blabbering non-stop about things we are uninterested in yet we must listen to escape from being labelled as 'rude'. In the meantime, the angpao collection is still in progress slowly. I still have a lot of cookies at home. The door is still open for guests. Reunion lunch and dinner on the 6th February. It's delicious. Don't judge by how it looks. There's soup too. Groundnut soup which tasted bitter last year turned out delicious this year. I've improved. Haha..!! Yesterday was quite a normal day visiting relatives and eating and collecting angpaos. Just another seven hours or so and it'll be the first day of Chinese New Year. The best part of tomorrow is, no more house chores! Because everyone has been working so hard doing last minute spring cleaning these few days. Imagine what a relief it will be without having to work tomorrow. 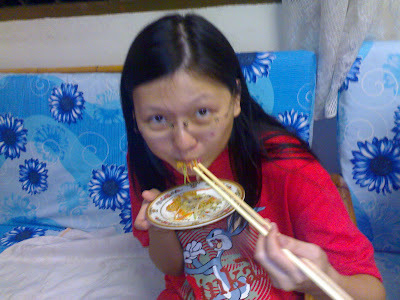 For me, CNY is not merely a celebration to earn more pocket money from married couples. It's more of a celebration to pay off all our efforts in spring-cleaning our home. Plus, we get to eat more junkfood during this festive season like never before. Usually, you will have to buy junkfood on your own but during this time, people serve them to you! What a bliss it is! However, there are two sides to everything. For CNY, there are plenty of good things. THERE'S ONE MAJOR PROBLEM. The earth mysteriously approached nearer to the sun to signify the Lunar Year. Especially this year. I can't stand the humid weather! It's time to air-condition the whole house. This is what I call an EMERGENCY MEAL. This afternoon, dad called home to tell us that he will not be able to come back on time to take us out for lunch. He asked us to go out on our own but I did not want to eat out so this is what my sis and I came up with. Some instant noodles with mom's recipe to make it delicious + fried eggs + nuggets. Everything is just a fry away! It's a rather pitiful meal, right? Yeah, I know. All of a sudden, we received so many/much CNY goods from friends. I don't think we will be able to finish them so I hereby invite all friends who know where I live to come and help me do a favour. ALL FRIENDS ARE INVITED TO EAT AND DRINK AT MY PLACE DURING CNY. FOOD WILL BE BOUNTIFUL. This is not a joke. I am sincere and serious about this invitation. Seriously, this year is such a fantastic year and we are so blessed with so much food. All we bought is just some can drinks from Giant. You can see how much we actually saved, right? Friends, you can come to my house at any date between 7 February to 21 February. But please call beforehand just in case I might be out. Then you will have to face Crystle's wrath. She hates strangers (strangers here means people she has not seen before). 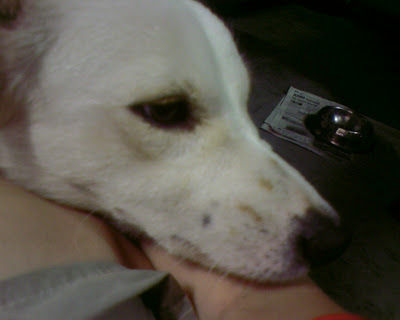 Even if you are a close friend, she would attempt to bite you and scare you away. No fear! Just inform me before you come and I will guarantee you a secure entry into my humble home. The eyebrow-tattoo is in the trend among dogs too! Since they don't have money to get a professional to help them with they eyebrow-less eyes, here is what they will do. Absolutely free-of-charge. Now that I have eyebrow, I am satisfied. I feel more human. Actually I don't know what Crystle did to her left 'eyebrow'. Why is there only one side done? Probably she has no mirrors to check on her brows or she has no money to do the right side. One thing for sure, her newly grown eyebrow IS ABSOLUTELY NOT MY DOING. I am innocent. Everyone in the business world knows this, 'Maximise profit, minimise cost'. But I am totally shocked that some people would do such a thing to maximise profit. Can you see that one of the spoons is out of shape? IT ACTUALLY MELTED when my bro used it! I've told him to use metal spoons which he finally did after this plastic spoon melted. DON'T THEY REALISE HOW POISONOUS IT IS? 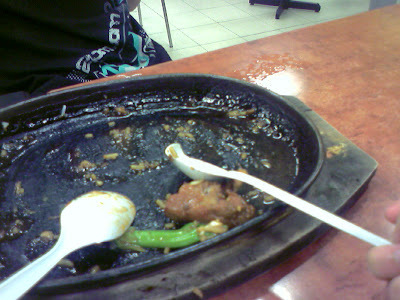 Never ever serve the customers with plastic cutlery if you are selling sizzling food. You will kill them one day! Just because plastic spoons are cheaper, you still cannot do that! After salivating over the nian gaos from Cold Storage the other day, we finally bought two freshly baked nian gaos from the night market. Imagine, so fresh that you can actually scoop it up and eat!! Yummy! Please try to attend and pay your last respects to Nian Ning. Your attendance will be very much appreciated. I am twenty this year! Can you just imagine? I'm no longer a teenager like I used to. Two years ago, I was supposed to be twenty. But it wasn't real. It's real this time. So, so real. Went to Johnny's Restaurant for dinner and these were the food that we had. 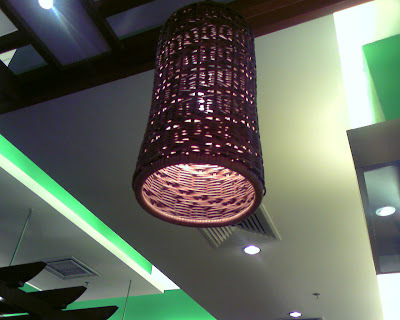 Isn't this a lovely lamp? We didn't eat this of course. Deric ordered this. 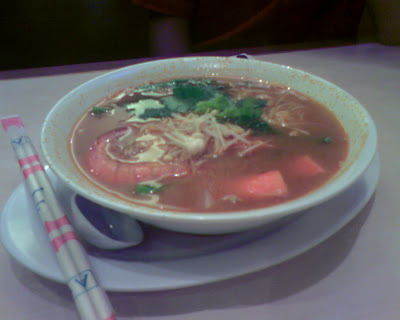 Tomyam noodles! 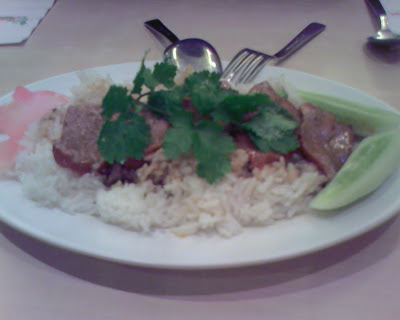 BBQ beef rice. Dad's choice. I don't fancy beef that much so I did not order that. 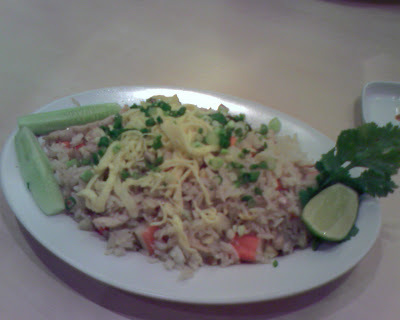 Pineapple fried rice. Eunice loved it. Not too bad. But the taste is a little bland. 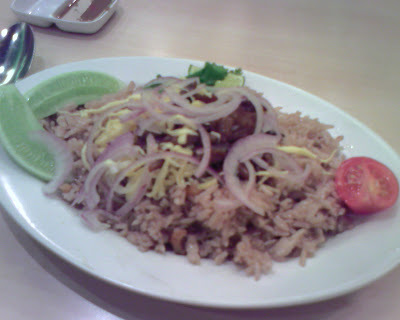 Belacan fried rice. 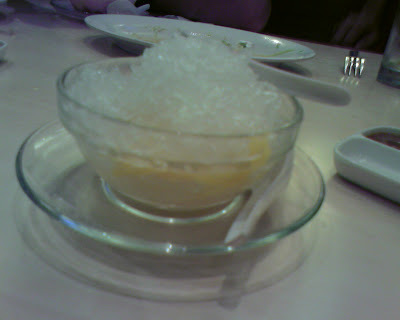 The rice looked like unpolished rice. It was very delicious especially when I added the gravy from the mango appetizer below. Very appetizing and sour! I liked it!! The yellowish thing inside were nangka! Luckily there weren't many slices of them. Back home, it's time for a break before the cake-cutting ceremony! It's nothing big, but the word ceremony sounds so grand. Oops, no break for me. I have to cook dinner for naughty Crystle. My sis could not take a break too as she had to be my photographer. My birthday outfit. Nice or not? First, take the chicken meat out of the refrigerator. Wash, wash and wash till the chicken meat is sparkling clean. No soap is needed unless I want to kill Crystle. Cut, cut and cut! You can mince it if you want. But I am lazy, so cutting is enough. My sis want to try to get her fingers chopped too! Finally did it! Eh, why isn't there blood? Next, boil the meat (including my sis' finger) in a small pot with little water. By this time, Crystle could smell the sweet aroma coming from the kitchen so she came and took a peek. It is ready to be served to the beast outside. The little beast. Looks so plain but Crystle loves it! Just two candles so I couldn't arrange in any creative ways. Should I look happy or sad? Happy because I don't have to light up so many candles. Sad because I am getting older. She can't wait to be 18, I guess. The legal age is so tempting. Stupid plastic knife designated for right-handed people! I am forced to cut with my RIGHT hand which does not feel RIGHT. So many prezzies!! The hair bands looks like cabaret girls' skirts according to mom. Zipper bag and handphone bag. Down Memory Lane. Cute fluffly bear with a pink heart! I can't get enough of snapping pictures. 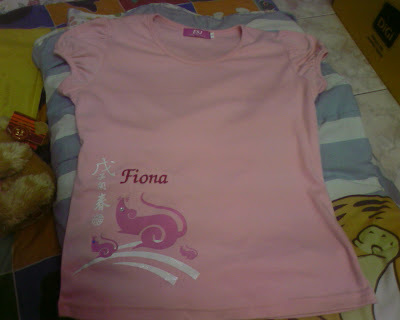 A blouse with my name on it. This was what the parcel contained with the other two hair bands. P/S: Wish mom was here to celebrate. It'll be such a blast if you are in Ipoh. Thanks for the presents and everything! Love you. Muaxie muax! !